Abigail Wood, SOAS, University of London/University of Haifa, Israel, “Towards a sounded ethnography of being here: European and American Christians in Jerusalem’s Old City”. Enrico Bartolomei, PhD candidate, University of Macerata, “Judaizing Jerusalem, eradicating its Palestinian history: the Mamilla Cemetery case”. Abdelrahman Halawani, PhD Candidate, Department of Urban & Regional Planning, Palermo University, “The Reality and Unreality of Jerusalem”. Valentine Bandieramonte, PhD candidate, Iuav, "Building the Jerusalem of the pioneers. 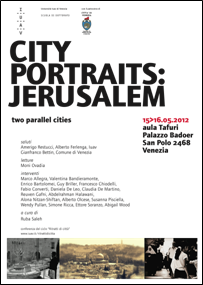 The Work of Conrad Schick"
Fabio Converti, Assistant Professor at the Second University of Naples, Faculty of Architecture "Luigi Vanvitelli", “Knowledge sharing and identity: strategied to spread the world cultural heritage for the quality of life in Jerusalem”.